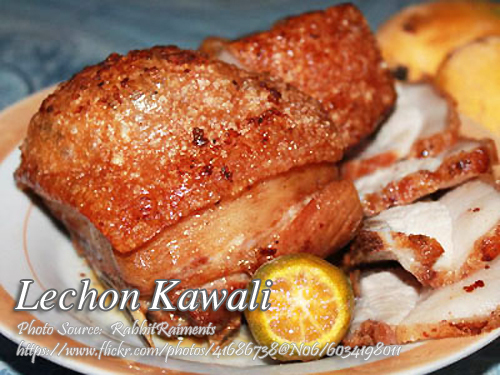 One of the well known and favorite Filipino dish is lechon kawali. I’m not sure why it is called lechon in the first place because lechon dishes are usually roasted or broiled over live charcoals like the popular “Lechon” or roasted pig and the “lechon manok” or roasted chicken. Since this dish is a whole chunk of pork belly deep fried until the skin is crispy, I think this should be called fried pork belly or pritong liempo. Anyway this is the way it is traditionally called so we might just as well enjoy it! To cook lechon kawali; Boil pork belly in water with salt and MSG until skin can be pinched easily. Remove from fire and drain Cool and air-dry. Deep-fry in a deep saucepan until tiny blasters appear on the skin. Chop into serving pieces and serve with Lechon-liver Sauce. Boil pork belly in water with salt and MSG until skin can be pinched easily. Remove from fire and drain Cool and air-dry. Deep-fry in a deep saucepan until tiny blasters appear on the skin. Chop into serving pieces and serve with Lechon-liver Sauce. Mix liver paste, vinegar, water, bread crumbs, sugar, ½ of the kasubha, laurel, salt, pepper and MSG. Blend well and set aside. Saute garlic in cooking oil. Add the onions and fry until tender. Add the liver mixture. Boil without stirring. Do not cover the saucepan. Add the rest of the bread crumbs dispersed in 1 cup of water. Cook till it thickens. Serve sauce topped with the rest of the crisp brown garlic and fried kasubha. Good for 6 persons. Kasubha is a Filipino word for American saffron. It is actually safflower which is an imitation of saffron.